I have Einstein Coat pics as promised ages ago. I guess that's a pretty big picture, but I love the colors in this yarn. I know I've said it before, but I'm in love with Noro. 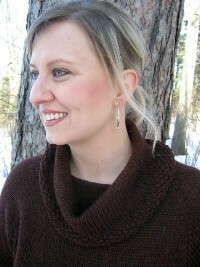 This is Forecast by Stephanie Japel from Knitty.com. I messed up the button placement so that's why its a "side-ish" view. 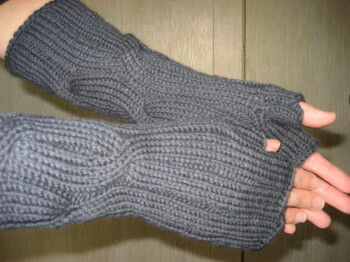 I also lengthened the ribbing on the sleeves and only did a three stitch instead of a five stitch bobble. This is "Nicole", both the yarn and the pattern are by Adrienne Vittadinni. 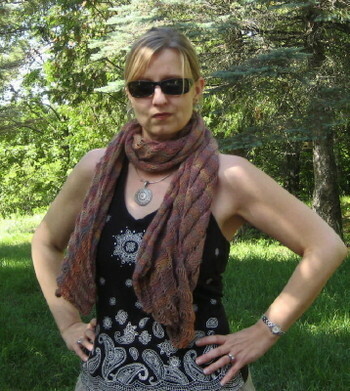 This is "Simply Marilyn" from Interweave Knits. Can you spot the row of very unhappy stitches across the middle of the back? Oopsie. I knit Marilyn in Lamb's Pride Bulky. My seaming job was also not that great, but I'll give myself some credit for being a beginner. Below is my first sweater attempt. 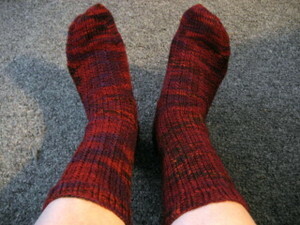 It is called Cables After Whiskey by Lucy Neatby. It is a great project for beginning cable-ers. You toss a dice to see if you will be knitting a two stitch or four stitch cable either to the front or back. The result is a very organic looking sweater. This was knit in sport weight. I hope you have a fabulous weekend! I'm off to participate in a belly dancing workshop this weekend. I hope to have a few pictures to show you when I get back. I'll be bringing some knitting for my hotel stay. I'm taking a much needed summer break from school and I have many knitting projects to choose from. As you can imagine, I'm having a tough time deciding which project to take with me. Charade!! Yay!!! These have been on the needles since July and due to my schedule with school, I finally finished them this morning. We are having a heckuva blizzard out there so that means I get to knit. Sorry for the overexposure here. I don't know if you can tell, but the sock on the left is pooled much more than the sock on the right. 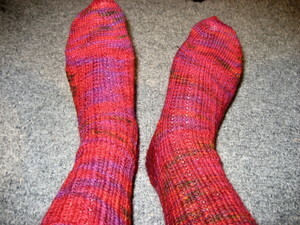 I used Wildfoote handpaint sock yarn by the Brown Sheep Company, Inc. The color is "Ragtime". I actually love the color, just not the way it pooled. I'm not sure I'd use this yarn again. Tried a little less flash here. Still not so great. I think you can click to enlarge though. Tomorrow I'm hoping to have my Forecast sweater done. She's been on the needles for a year and a half or so. Since it is blizzarding outside, I figured that this sweater would be appropo. Have a wonderful Christmas!!!!!!! No mystery here, I'm just finished with it. Here's the deal on this shawl. I got the yarn, I got the beads, I got the pattern. I Knit through row 38 or so and realized that the pattern required knitting part of the pattern from right to left. I knit it from left to right through the whole pattern. Perhaps I should read directions. That might help. So, maybe I'll try it next year. But maybe not. I mean, how often would a person wear a Halloween themed shawl? Never? That's right, probably never; because most Halloween costumes don't require shawls. I'm going back to school and my schedule daunts me. I have classes from 5:30-9:30 two nights a week. I'm not sure how I'm going to pull this off since I usually go to bed around 9 in the evening. Hmmm. Plus, I like to get to work really early in the morning, like 6:30am, so I can be done by three-ish. Eighteen hour days are so not my thing. I'm having scheduling issues here, and I need to figure this out. To RAVELRY! Sadly, sickly, without a way out, just plain addicted. Holy Crap! I think I need an intervention. However, I'm sure I will resist an intervention and succumb to the crackyarnmethpatternscocaineneedlespot that Ravelry is. It's powerful. Even with the blog neglecting that's been going on around here because I've been tweaking, I did manage a new finished object. Dashing from Knitty. I already did "Fetching" and thought that it was a great pattern. I used Lion's Brand Cashmere blend. Which was nicer than I expected it to be. 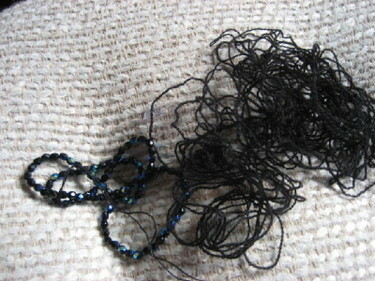 I used two skeins of the charcoal color and had just a little bit left over, maybe 3 yards or so. I used size 6 dpns instead of 7's. BTW, did you see CrazyAuntPurl's post today? I laughed so hard I cried. Finally....an FO and an equine "field trip"
It's a little too hot to be sporting this today....but, the lightweight clapotis is finished. Notice the smirk? It's because I used the 10 second self timer on my camera and was just a little doubtful of the outcome. The weather is so beautiful today that, I've been sitting in the yard kicking back a little Friday night drinksie. I was home from work a bit early today because Mr. Holly Knitlightly called me at work to tell me (in a panic stricken voice) that a kind neighbor called him and informed him that our two horses were loose somewhere on Highway 61. Yes THE Highway 61. Well, Mr. Holly Knitlightly took his truck and two halters and a bucket of grain and found them a mile down the road from us on the bike trail that was formerly a railroad track and is now a paved recreational trail that is 70 something miles long. During this horsecatching adventure, he stopped an innocent and somewhat baffled cyclist on the trail to help him by holding one of our "caught" horses while he wrangled the other one into its halter (It wasn't really hard, Mr. Holly Knitlightly had grain). In the meantime, on my stealthy drive homewards after receiving this news, I called the county sherrifs department to inform them of the potential 'horse-smeared-on-the-highway-by-a-logging-truck' disaster. I'm sure I was babbling, my horses are my "babies". The sherrifs dispatcher informed me that one of his troupers saw a man on the Munger Trail leading (of all things) two horses. YAY!! The dispatcher acted like it was no big deal. Horses get loose all the time. Well, buddy...NOT MY HORSES. So there. Needless to say I was relieved. Thus, the celebratory drinksies! Maybe I sound cavalier, but it was really horrible to think of what could have happened to the horses and I'm thankful they are safe and home now. I've thoroughly inspected both of the equine "Houdini's" and they are in fine form and just a little bit cocky about their unsupervised travels. Mr. Holly Knitlightly is now walking down the trail, retrieving his truck, since he walked back with the horses. Did you notice by the picture that I should be mowing my lawn? 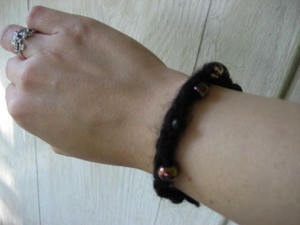 I found a knitted beaded bracelet pattern (uber easy) here. This is a perfect combination that incorporates my jewelry and knitting love. It is an easy FO. I seem to prefer making jewelry in the summer, but knitting in the fall and winter. Well, summer lasts about 2.5 months where I live. So, it is mostly knitting for me! I'm thinking of making more of these in different colors. I just learned to make my own glass beads. Blowtorch and the whole deal. I need another hobby like I need another full time job.